Other names: Monkey fruit, giant yellow mulberry. Nigeria, Sudan, Tanzania, and Uganda. 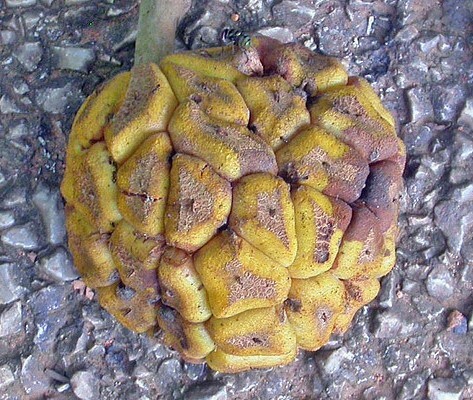 This fruit grows in clearings of tropical rain forests. It is not cultivated. A medium sized dioecious evergreen tree, growing upto 20 m, with a spreading canopy. 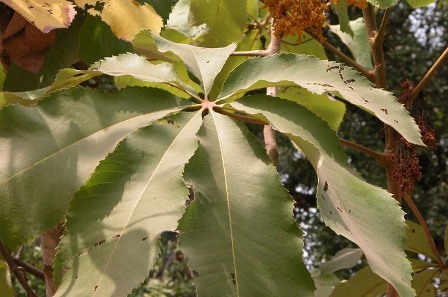 Leaves are palmately compound, 90cm-60cm across, leathery, with a pale green color on top and a whitish tint underneath. 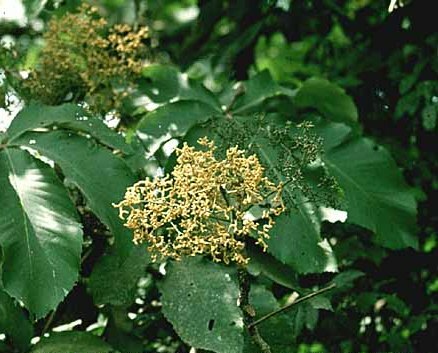 Male flowers dark yellow and look like multi-branched deer antlers; female flower a small multifaceted ball with small flowers arising from each section. Fruit a syncarp of basally fused, yellow false drupes, up to 20 cm in diameter, with stylar remains projecting from each drupe; round, and divided into 2.5cm, 5-sided sections; each section consists of an outer tough thick, sand-papery skin, an inner pulp which is soft, and a thin layer of sweet gelatinous flesh, that surrounding the seed. Seed, hard, oval light brown. Fruits are edible. In fact every part of the fruit except the thick skin of each section and the central core which holds each section in place is eaten. The pulp, which is quite juicy, is delicious having a pleasant sweet and sour taste. The kernel inside the seed is also edible and fondly eaten. Ongo trees have been observed to do better when planted under partial shade. But they can also be planted in open sunlight. New trees can be raised from seed and they start bearing fruits in 4-5 years. This tree appears to do well on its own, in most soils, but it could stand some organic mulches and periodic watering when needed. It probably could do well in an orchard system at an 8m x 8m spacing. Ongo trees should be planted in damp/ swampy soils. These have the ability to improve nitrogen levels due to its mycorrhizal associations. 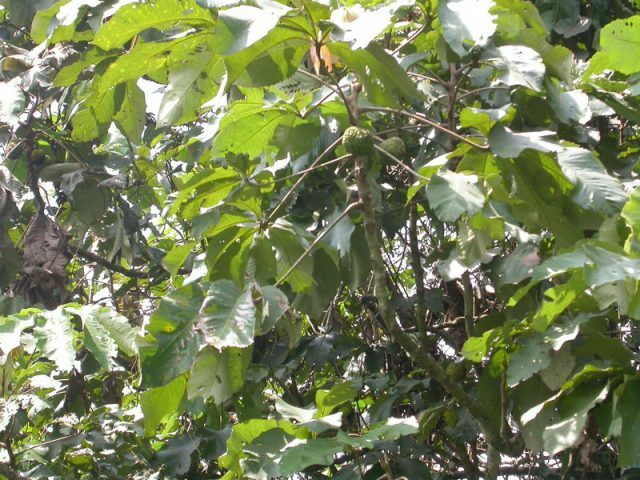 Leaf litter ongo trees improves soil fertility.